Best known for: Bucerias Largest All-Inclusive Hotel! 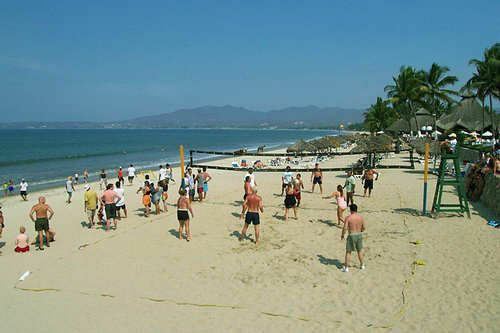 This hotel is located on one of the most beautiful beaches in Bucerias, 15 minutes from Puerto Vallarta. Known for its colorful architecture, lush vegetation and five swimming pools (one adult only pool). 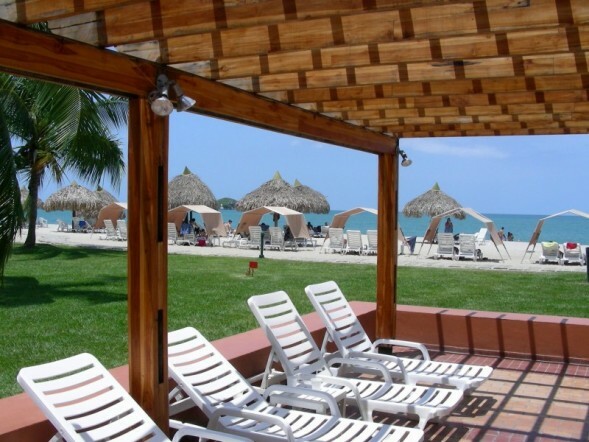 Located on the best stretch of beach on Banderas Bay, the Royal Decameron allows guests to enjoy swimming, sunbathing, and access to free non motorized water sports. 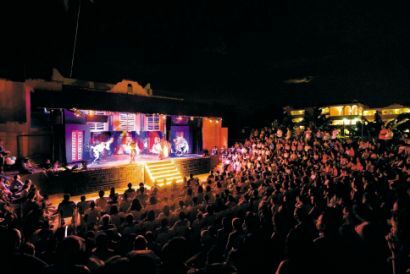 Guests can also enjoy one of the large variety of buffet and a la carte restaurants, all you can drink at any of their six bars, and dance at the discothèque after the nightly show. All-Inclusive! Includes room, meals, drinks, activities. 7 Restaraunts! Wifi included in some areas. 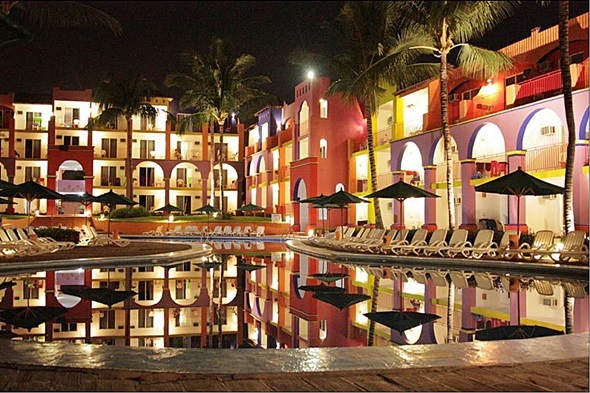 The Royal Decameron is surrounded by lush gardens, built in the mexican style of vivid colour, with private balconies surrounded by great scenery. Enjoy romantic sunsets from one of their beautiful ocean view or ocean front balconies! 4 pools, including adults-only pool + 3 children's pools, 3 tennis courts, basketball court, soccer field, beach volleyball court, 2 gift shops. Night club, 509 rooms. 275 yards of beachfront land, shuttle bus, money exchange, 24 hour doctor, massage and beauty salon. Buffet style and a la carte dinners, 4 specialty restaurants, 2 snack bars, 3 beach bars, pool bar, lobby bar and a night club, daily activities program, scuba diving instruction in the pool, tennis courts and lessons with tennis pro, nightly entertainment, air-conditioning, satellite TVs, telephones, in-room safes, balconies or patios. One king or two double beds in an air-conditioned room. All with balcony or patio with a view of a garden, pool or the ocean, rustic mexican-style decor, furnished balcony, tiled bathroom with tub/shower combination, telephone, in-room safe (fee), cable TV. Book your next travel vacation at The Royal Decameron Bucerias! I am looking into vaction palkg. for me and 2 of my kids. Can I get prices a 1 room 2 beds. Dates would be 6/17-6/21s all inclusive please. please forward the cost of a 2 week all inclusive stay for one adult AND the cost of a double for two weeks This is for first 2 weeks the first of feb. I was reading comments. Some one stated that bring your own toyleties. Do they have a blow dryer,shampoo,soap etc? Also a iron? Thanks for any information you can provide us. We are leaving tomorrow. We spent five 2 week vacations there and got to know the area quite well, very helpful as we returned later to RV in Rincon de Guayabitos, just north of Bucerias. We have to thank R de C and its friendly, helpful staff for introducing us to that unique Mexican way of life! 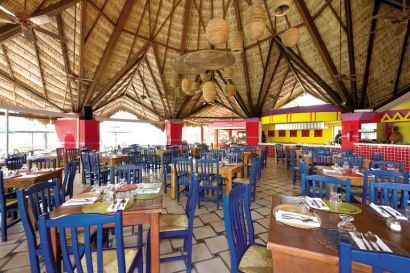 The variety of menus available, the nightly entertainment, the great beach and proximity to PV makes this all-inclusive hotel one of the best and fairly priced in all of Mexico! The resort is colorful, bright and huge - with many visitors and workers alike. My first and last impression was how immaculately clean they try and keep the resort. Day and night, you can see numerous personnel sweeping streets, scrubbing walls, repainting, trimming hedges, picking up litter they pass by, and washing and handscrubbing pool loungers. The rooms are stocked very basic so yes bring your own toiletries, including a roll of toilet paper if you're a sucker for soft tissue. The bed was a bit firm but I actually liked it and slept well most nights. There was a foam mattress topper already on our kingsized bed. We stayed in room 5226 which ended up being a good location, far away from the hustle and bustle of the main part of the resort and convenient as we enjoyed the adult pool below most days. We ate at the Italian A La Carte one night and surprisingly as I was disappointed after hearing previous reviewers - in fact, we happily enjoyed eating at the buffets for dinner, with our favourite location being at Flamingos near Block 1. The evening shows put on by the animation team were spectacular and exceeded by expectations. Do check out the Mexican Fiesta on Thursday nights, the food was spectacular, delicious and there were fresh handmade churros - 'nuff said! Where is the best place to buy silver jewelry? What is your rate for a Janaury 19-26, 2013 stay for two adults and preferably ocean view? We have stayed at the Royal Decameron seven times since 2008. Love the staff, love the location, love the price! It is our favourite destination, always a great time. Just returned from my second holiday at The Royal Decameron. I have also stayed at Decameron in Panama. I also hope to return. The staff, food & drink are wonderfull. The hotel & grounds are imaculate. We were there 14 days & there are a couple of things that would have made our stay even better. Water was only available 24 hrs at Bar 5, we were definately not drinking enough, as we got dehydrated. Also, even though we were there 14 days, the earliest our room was ever cleaned was after 4:30! I hope this has been usefull.